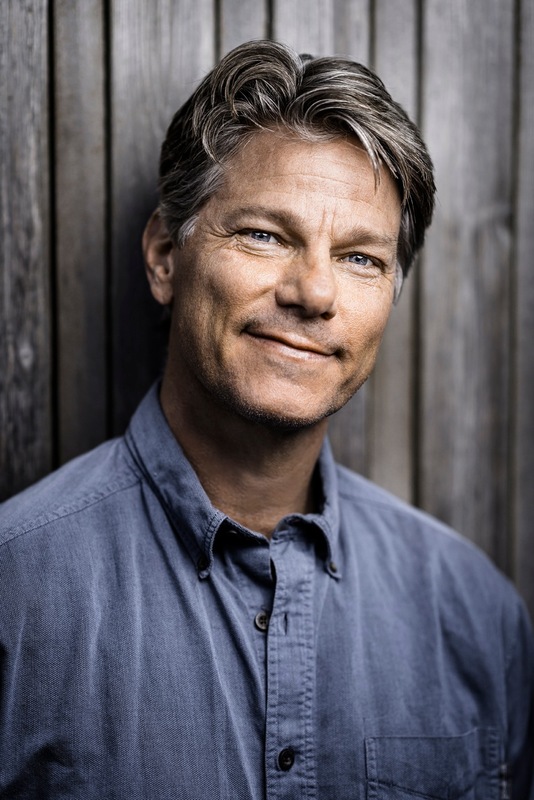 The environmental activist inside critically acclaimed author John Vaillant was awakened through his journey of writing The Golden Spruce. The book tells the story of a spiritually significant tree and a troubled, misguided individual named Grant Hadwin, who cut it down in 1997. Visiting Haida Gwaii on assignment in 2000, Vaillant heard the story of the felling of this special tree and felt compelled to write a book. He crafted the story into a must-read for the environmentally-minded, weaving in Haida legend as well as the actualities of the BC logging industry, past and present. When he was later inspired to write a book based on the film Conflict Tiger, he sent a copy of The Golden Spruce to British filmmaker Sasha Snow in 2006 to prove that he was “a real writer.” Two weeks later, Snow called him back and said that he wanted to make a film inspired by The Golden Spruce, too. What a beautifully symmetrical exchange of ideas. The resulting film, Hadwin’s Judgement, was released in 2015 in Canada and the UK. Our co-director, Isabelle Groc, interviewed John Vaillant before a special screening of the film this month at the Vancouver International Mountain Film Festival (VIMFF), where the Toad People trailer was shown before the feature presentation. We were very happy to share the evening with John, who graciously contributed the proceeds from his book sales at the event to our Toad People crowdfunding campaign. 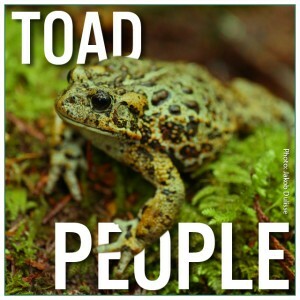 Are you a Toad Person? 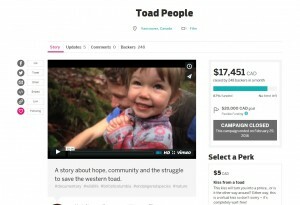 Toad People are people like you, in communities across British Columbia and beyond, who are stepping up to protect the wildlife in their backyards. You can become a Toad Person by supporting our new documentary film project to help bring inspiring wildlife stories to the big screen. Check out this short video to see why this project is so important to us – and to the many at-risk species that call BC home. Are you a Toad Person? from The Wilderness Committee on Vimeo. Become a Toad Person! Check out our campaign on Indiegogo. We are very excited to announce the launch of our Toad People crowdfunding campaign, along with the release of the trailer! Crowdfunding is a way to contribute money online for a specific project you support. Your contribution can range from just $1 to $5,000 or more, and if you choose, it can come with a perk. 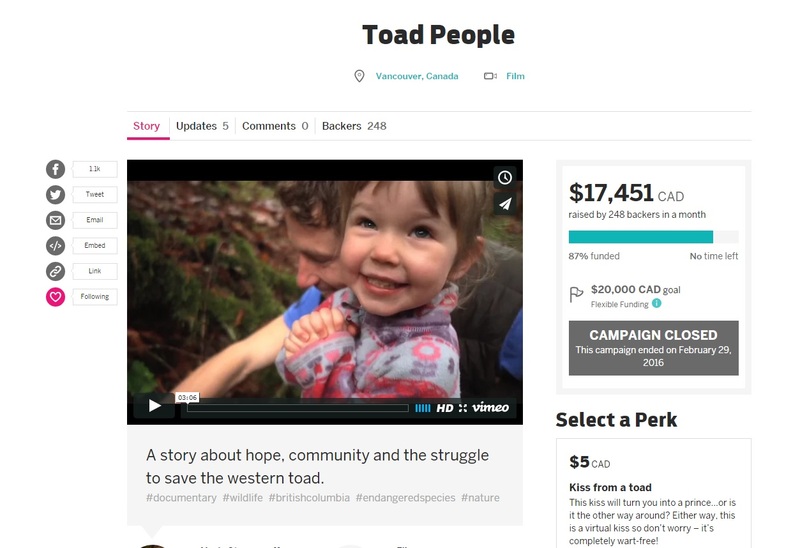 We are aiming to raise $20,000 for Toad People to cover filming, sound editing, music composition, post-production editing, community outreach and screenings.